Boracay is a small island with a thousand wonders to discover. I’m sure you’ve heard a lot about the appetizing restaurants found in D’mall, the beautiful Puka Shell Beach, the caves at Crystal Cove and even the famous Willy’s Rock. But how will you be able to find these attractions if you don’t even know how to get there? 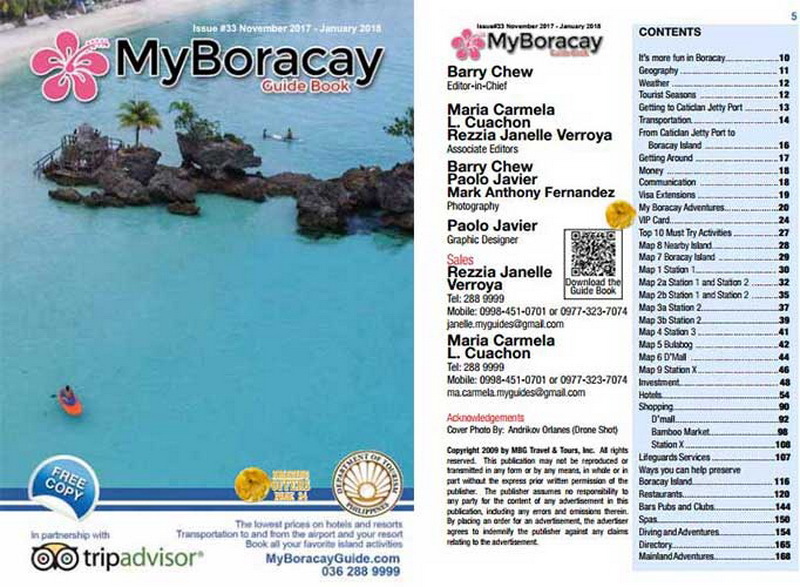 My Boracay Guide Book, Map and VIP Card has been in distribution for more than seven years at the Caticlan Jetty Port, Shangri-La’s Jetty Port and also at Fairways and Bluewaters Jetty Port, helping thousands of tourists coming to Boracay to have positive experiences. How do you get the discounts and free info? 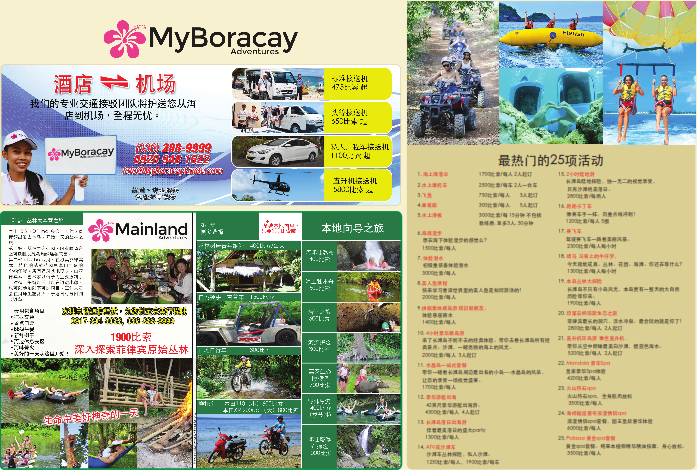 Before you get on the pump boat be sure to stop by the My Boracay Guide office at the jetty port and pick up a Guide Book or Map from 9:00 AM – 6:00 PM for FREE! Yes, they are FREE. Every quarter our team updates the Guide Book, Map and VIP Card highlighting the different businesses on the island and introducing you to the new ones. If by chance you weren’t able to get a copy on your way in, don’t worry. 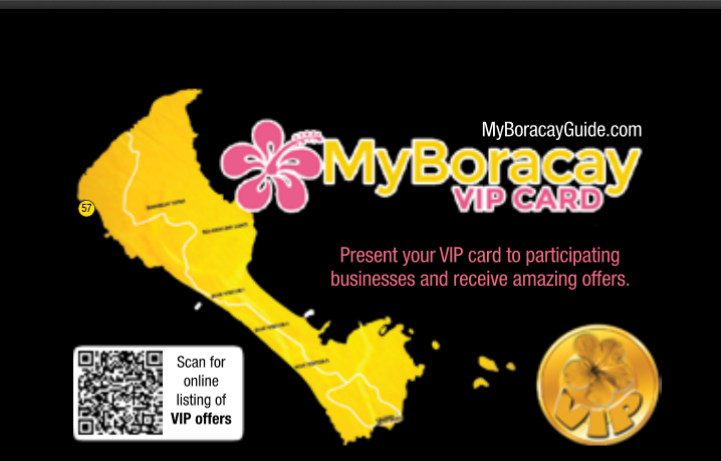 They are also available for download or can be viewed on our website myboracayguide.com! QR codes are also seen on the guide book and map for direct download to your iPhone and Android phones, if you don’t want to carry around a hard copy. Grab a guide book, grab a map, everyone’s a VIP! Everyone’s a VIP! How does this work? Just present the VIP Card before paying your bill to avail the offers! Best part? The VIP Card is also valid for three months (always check the validity date) and you can use it every day! For you to check the offers, it can be seen in the guide book or at the back of the main map. My Boracay Guide wants you to have the best vacation without getting lost or having a hard time. 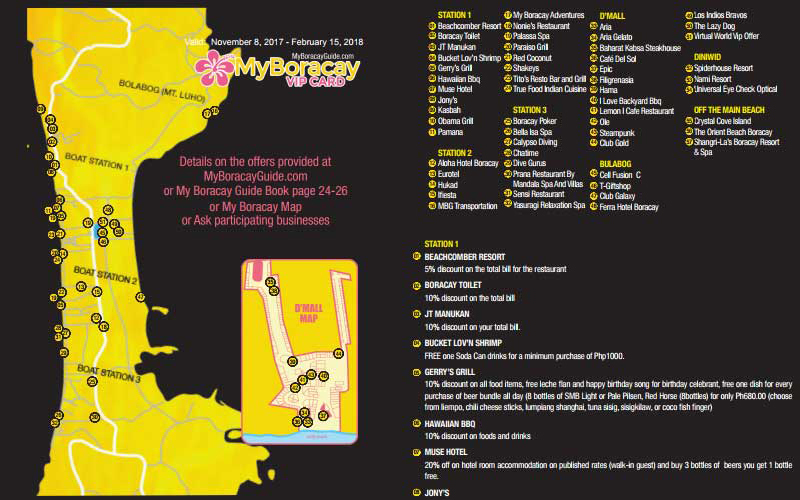 So, the next time you see My Boracay Guide Book and Map be sure to grab a copy! No worries because some of the best things in Boracay are FREE! 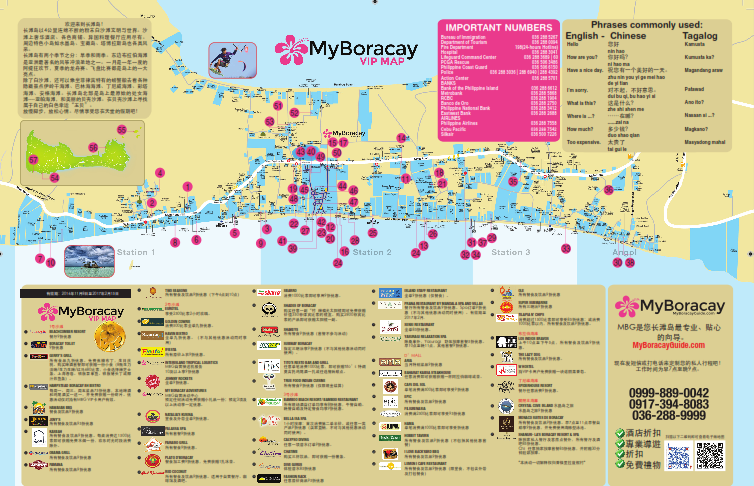 Download the latest issue of My Boracay Guide Book and Map here! This entry was posted on 星期二, 二月 7th, 2017	at 5:41 下午	and is filed under Specials, 最近	. You can follow any responses to this entry through the RSS 2.0	feed. You can skip to the end and leave a response. Pinging is currently not allowed.